My co-worker and his wife are having a baby. I whipped this up as a gift for them when the time comes. Wonderful scrappy! The baby will love looking at it. Sew cute & colorful. The baby will enjoy that quilt. I've done this with scraps - love the design! Would you post the source of the pattern? Very colorful and fun...I’m sure the expecting parents will be delighted by your thoughtfulness. A great scrappy! my favorite! Wonderful quilt!! Great cheerful colors! Babies love bright colors!! This is wonderful! Love the way you have set in the light blocks. 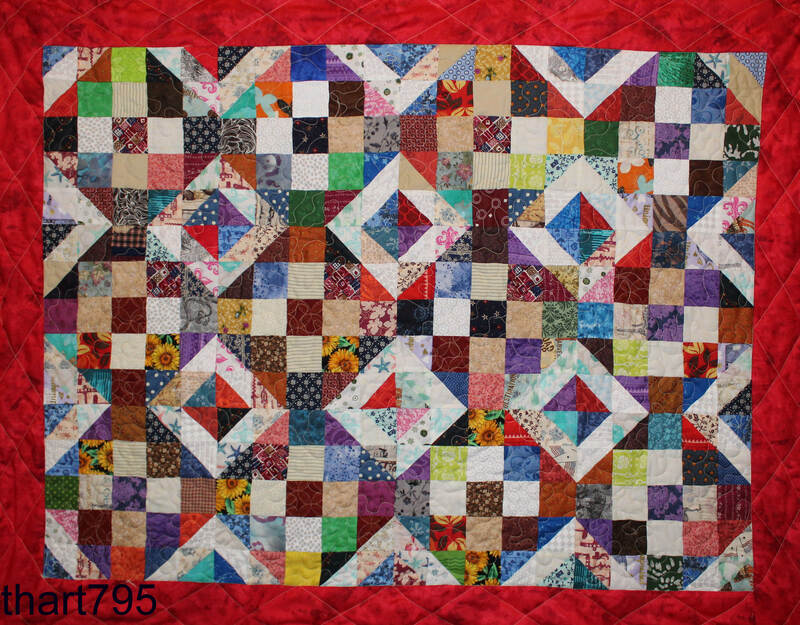 Love it--scrappy quilts are so colorful. It's one that I'm writing, not finished yet but I'm anticipating that it will be posted by tomorrow. So nice and love the bright colors. Very, very pretty! The baby is going to LOVE the colors on that! Great job! Wonderful! Baby will love it because it's so cheerful and bright. So colorful and fun. Great gift. Great scrappy. I love it. Nice! What a great gift!